Here at Blog Time Now we have seen many embedding tutorials such as embedding Google maps in Blogger, embedding Google maps in wordpress, embedding Facebook videos in a website, embedding SoundCloud in Blogger and embedding media files in wordpress. All those tutorials are made easy and that is because all sites simply offers an code in which you can easily embed objects anywhere without spending too much time and effort. Embedding Bing maps are easy too! Here we will show you how to insert / embed Bing maps in your website that is on both wordpress as well as Blogger. Almost, not certainly both Google and Bing offer products and services that are similar to each other. They both as a search engine offers web search, image search, video search, news, maps, webmaster tools, translator and more. Bing is a nice alternative to Google and for anyone who got tired of using Google can go for Bing. But to be frank, In Bing the features are less when compared to Google products. Alright! Let’s focus on the topic, about embedding Bing maps. In Bing maps you can quickly and easily get directions, find businesses as well as locations. Similar to Google maps, in Bing you will get features like road map and satellite map, other than that you will also have different options to view and embed maps such as street view, bird’s eye and Ariel view. 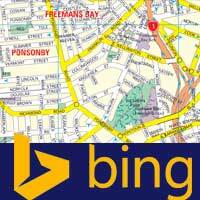 If you find Bing maps to be useful for your visitors then you can simply embed it in your website. Bing maps are free to use, share and embed. First go to Bing Maps. The interface in Bing is pretty much same as old Google maps. Before you can embed the map, you have to first spot the location. To find the location you can use the search bar or you can simple drag and zoom the map to exact location that you are looking for. After spotting the location you will have several options just above the map such as road map, bird’s eye, aerial, traffic and street view. Next at the top right corner you will see share option, just click on that and a window popups. Now you can see the embed code; wait a second don’t copy that, to get the accurate map results click on customize and preview. Now a separate window will open where you will have several customizing options. Choose whether small or larger map or you can even go for a custom size. Choose map options that is whether the map is draggable (draggable map will have the ability to pan and zoom) or static. Choose map style that is whether road map or aerial map, remove map links if you want and when the preview result is ok, then finally click on generate code. Now you will get a embed code in another window, just copy that and then proceed to next step. You can easily embed Bing in your wordpress posts and sidebar. For example if you wish to add the map in a page or in your post, go to wordpress dashboard >> posts or pages and then switch to text editor. Now paste the code that you generated in Bing and when done publish your post. So the result will be like this. If you wish to add it in your sidebar then go to Appearance >> widgets, move the Text widget to your sidebar and then paste the embed code in. But make sure to adjust the map size that is to fit your sidebar. For wordpress there are several plugins to embed maps, but one thing that has more options is Leaflet maps marker. Leaflet maps marker allows you to embed Google maps, Bing maps and open street maps in to your wordpress site. With Leaflet maps marker you can mark, pin and show off your business address or any other favourite places to your site visitors. Using this plugin is fairly simple, you can get whole plugin documentation and support at mapsmarker.com. Embedding Bing maps in Blogger is same as what we did for wordpress, but for Blogger you don’t have any plugin or gadgets to add further features. Go to bing.com/maps, choose map size, select maps style and after customizing as per your needs, generate the code and grab it. Now go to your blogger blog. Embedding maps in contact us page will help your visitors to find directions. For example go to dashboard >> pages create or open contact us page, switch to HTML editor and paste the embed code. The same way you can embed Bing maps in to your blog posts. Hope this post helped you on how to insert / embed Bing maps in wordpress and Blogger. Please share it and if you have any other questions, then feel free to ask us using comments below.